Core Design is naturally based on other methodologies; it is a convergence of system development and media production methodologies. And in order not to refer either to system development or media production – the term creation is chosen. The terms development and production is still used, however specific referring to respectively the development of features and the production of assets. The agile principles from system development are adopted in core design. The basic idea of Core Design is to focus on the core of the future digital media system, make that work with as few features and assets as possible, check it again, and be sure it actually works; and then create the full system around the core. And in spite of this effort something might very well not work anyway later in the process: Then return to the core, and make it work. The Core Design philosophy is, if the core is not fun or whatever the quality criteria is, then the golden master – the full system – will not be fun either. The digital media system will not be better than the core it is created around. With other words: Keep the core simple. Not the digital media system as such – because there might be as much code in e.g. a big computer game as there is in a space shuttle. And formulated as Core Design philosophy: Behind any complex system, there is a simple core system. When creating digital media systems both assets and features are created in a parallel and integrated process, where they in general both are equally important. This means that both a theoretical and aesthetic perspective has to be managed at the same time when creating features and assets. And this process is very often depending on different people with different backgrounds such as programmers and graphic designers respectively speaking in C++ and drawings – respectively making important decisions with logic and feelings. Core Design philosophy is that all people on a creation project makes ongoing decisions about the product quality – except the project manager, which is important. The project manager only makes decisions on the process. But the core design is the quality criteria, prioritized by the design team manifesting the minimum viable content and features. This makes it akin to the notion of ‘MVP’ (minimum viable products), with the important difference, that core design does not speak about specific concrete product features yet, but rather suggest that we focus on defining ‘what the quality should be‘ before what the concrete technical features enabling the qualities might be. So where a methodology like Scrum is made for engineers, programmers or likewise, Core Design is also made for other humans like animators, CG-artist, and art directors. One of many good things about Scrum is the sprint planning, where the features are prioritized. However if the future assets and the feelings behind them are not integrated in this process, the digital media creation will very probably fail. Assets and features are normally equally important in digital media creation. For example will the system supposed to be fun most likely be boring if not annoying, if the assets has to follow the features. So people behind the digital media system have to agree on what characterize the good system – they have to agree on the core. 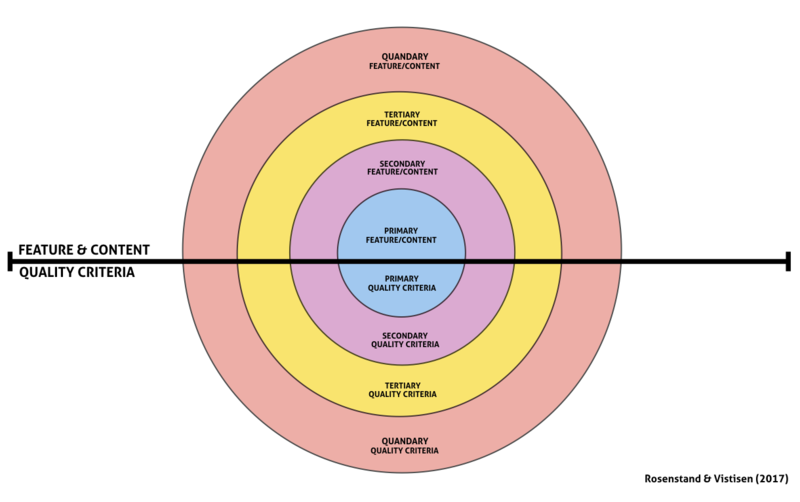 When generating insights, from field work, case settings or from stakeholder input, we can be translate these into how they manifest and represent certain quality criteria, and then begin to arrange these in different orders of importante (primary, secondary etc.). Based on these different configurations, the framework helps facilitate a discussion about what the core of our concept is – before investigating the specific features and content enabling the core qualities. The different configurations might also inform, which aspect of the forming concepts are most important to test or investigate early on – if the core is not thoroughly qualified, there is a risk that the secondary, tertiary, and quandary qualities will fail to be meet too. Thus, Core Design is a generic methodology – it is both flexible and scalable. It is flexible regarding the scope; and it is scalable regarding manpower, which benefits innovative projects in terms of the way it enables the participants to involve various parts of each stakeholder in a flexible way, so the core designs contains a much relevant knowledge as possible.